A Daring Venture is a fascinating story about scientist, Doctor Rosalind Werner and her struggle as a woman in an all male science field. She works to prove that her theories can save lives, even when her methods may be questionable. She's a strong character with a heart for saving people from water born disease. But who wants to listen to a petite lady when money and power are on the line. Nicholas Drake, charming and a little dangerous, climbed the ranks from plumber to a man who decides life and death decisions. But he has a soft spot for Rosalind. The back and forth of their relationship entertains. One of the things I like about this story is the light it brings to the conditions of living with contaminated water. Many countries still do. We can't take it for granted. Elizabeth Camden's research into the time period illuminates her wonderful writing. 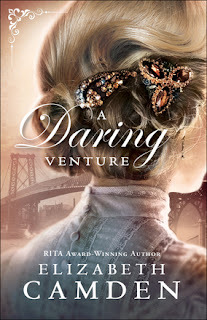 If you enjoy historical fiction, I recommend you read A Daring Venture. I received a complimentary copy of this book from Bethany House. Opinions expressed in this review are completely my own.